These details have now been moved to a separate web page at this site, refer to Future of the Club page. The course is in excellent playing conditions with no projects interrupting or interferring with play. In aid of the Olivia Newton-John Cancer Wellness & Research Centre. Stableford event. Sunday 19th May 2019. 7.45am registration for a 8.30am shotgun start. $30.00 entry includes lunch. Entries close Monday 13th May. Great value for a good cause. The club has an on-site Pro Shop that offers a comprehensive range of golfing facilities such as tuition, sales, repairs and club fitting. Kevin Quigley (whose picture appears to the right), the proprietor of the Academy of Golf, is the resident teaching professional. Insufficient players to award prizes for Birdies, or for C Grade competition so combined with B Grade. Insufficient players to award prizes for Birdies. 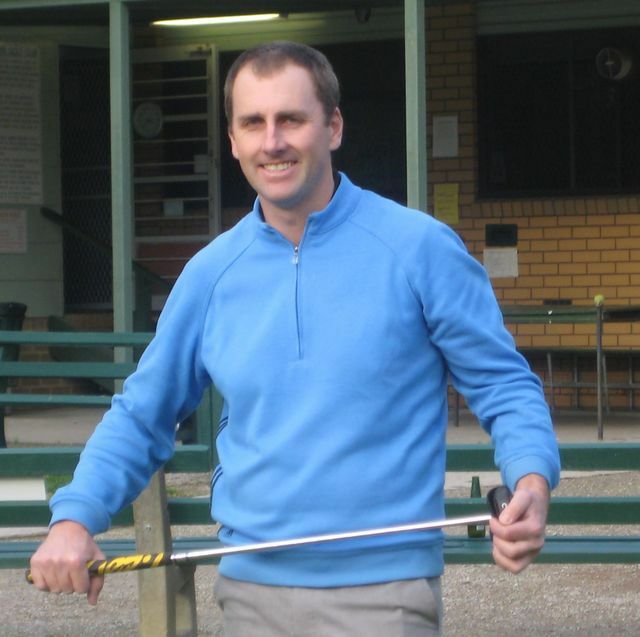 Congratulations to Russell Knight on winning the April Monthly Medal. Congratulations to Clive Pearsall on winning the T.J.Slater Trophy, defeating Geoff Blackwood 3 and 2 in the final.